Avertissement : Maurice Joron ne doit pas être confondu avec son père, Paul Joron, peintre amateur. Maurice Joron ne signait jamais du prénom de Paul. 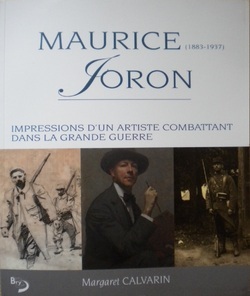 Maurice Joron : impressions d'un artiste combattant dans la Grande Guerre. L'album "Impressions d’un artiste combattant"
huile sur toile de 73 X 60 cm. 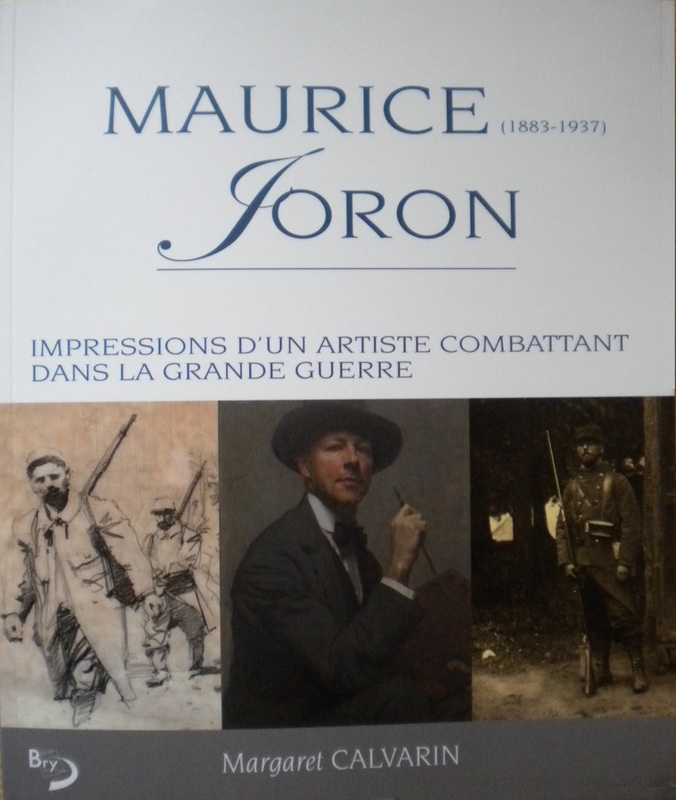 In the Adrien Mentienne museum in Bry-sur-Marne, the opening of a room devoted to the works of the painter Maurice Joron (1883 - 1937) owes a lot to the tenacity of, Marie-Louise Joron – the donor of the collection and of the exhibition space –and of the mayor of Bry Mr. Spilbauer. The project was launched as early as 1993, thanks to an exhibit organized by Anne Wilkinson (1938-2000). The delay between the outlining of the museum and its opening may be due to an irony of history : Joron, as a portrait painter, was under pressure from the competition of photo portraiting. However in Bry, the other great local was… Daguerre, one of the inventors of photography. The choir of the church in Bry preserves a diorama (a panorama which changes aspect according to lighting) by Daguerre, who was initially a painter before turning to photography. 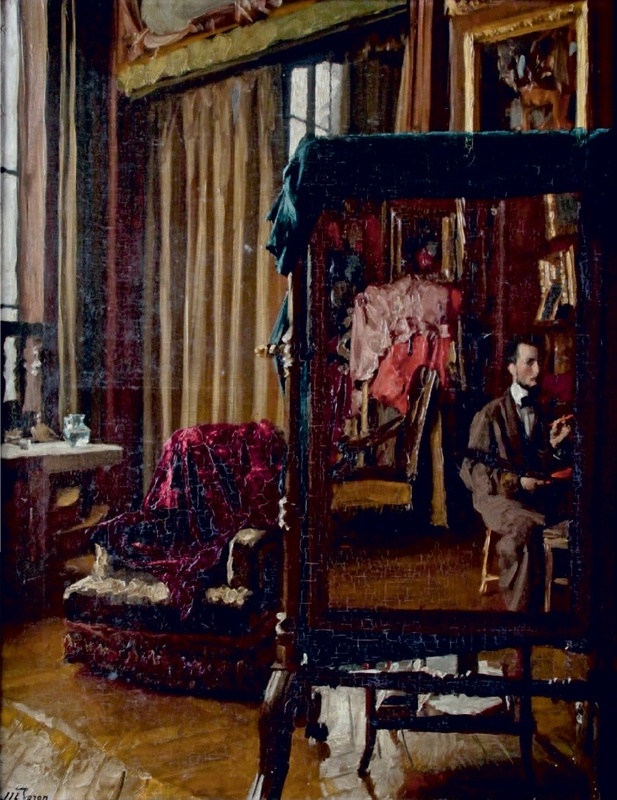 This unique piece required a long restoration but it would have been a pity to privilege Daguerre and neglect an exemplary painter: Maurice Joron, who could be described as a modern classic. All is exemplary in Joron’s life. As is the case with many artists, his vocation attracts some scorn. At school he regularly ranks first in drawing, but has a poor record in everything else. His father is hostile to his passion, and his mother favours his younger brother. The child receives more understanding from his grandparents. As a just reward, the museum is installed in the former farm of his maternal grandparents: at 6bis Grande Rue Charles de Gaulle in Bry. Through them Joron meets his patron, Mrs. Tavernier, a rich widow and art lover who holds an artistic salon in Paris, close to Parc Monceau. She is a woman of character; at 90 she would casually remark: “If I die young…”. (in fact she was still alive at 103). She is about 70 when she meets the future painter, who became as an adoptive son. She is the kind of patron any artist would dream to meet, offering material and emotional security, so that the talent of her protégé can bloom. Mrs. Tavernier finances his studies in the Beaux-Arts school, where Joron attended Cormon’s workshop, along with many prominent artists like Matisse, Osbert, Soutine, Lautrec, van Gogh... She opens the doors of her salon to him: the noted journalist Henri Rochefort writes about him right from his first exhibit (at 26, after being awarded a score of medals, Joron was qualified de facto at the Salon des Artistes Français). To catch up with lost time, she arranges lessons in history, Latin and French with abbé Thiriot. This tutor prompts in Joron a sense of curiosity that will never end, including voracious readings. From 1905 to 1913, Mme Tavernier takes him along on a grand tour of Europe (Italy, Greece, Spain, Holland…). In every place, he gets acquainted directly with the grand Masters ; above all others, he admires Titian, Vermeer and Franz Hals (his nickname at Cormon’s workshop). He always has his paint box at hand, as others would carry a camera, and makes numerous live sketches (now shown in Bry) to study the light of the various countries. His admiration for Titian will contribute to the budding of his vocation as a portraitist. He will of course start by portraying his benefactor. In 1928 Mrs. Tavernier withdrew in Fontainebleau with a nurse, and became somewhat mentally impaired, but Joron visited her regularly and produced multiple studies and drawings, as if to keep her intact: in his portraits, which have a place of choice in Bry. Empathy with the model shows through, against threatening death. Joron had already faced death during WW I : he was wounded at the Battle of the Marne. 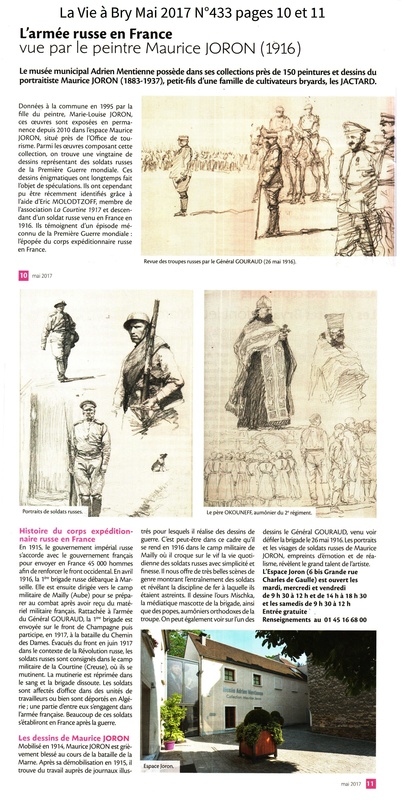 After surgery and decommission in 1915, he made many drawings for the war press and for Le Crapouillot: an entire wall in Bry shows a company of Russian soldiers resting… Joron, a war draftsman, was one of the last history painters. For the World Fair of 1937, the Ministry of Veteran Affairs, commissioned him for a 3 meter high fresco “From them to us” – a pageant from Saint Louis’s warriors to the Poilus of 14-18. In 1938, at the Salon des Artistes Français, this work went quite noticed, including by his colleagues. Then this masterwork went lost. 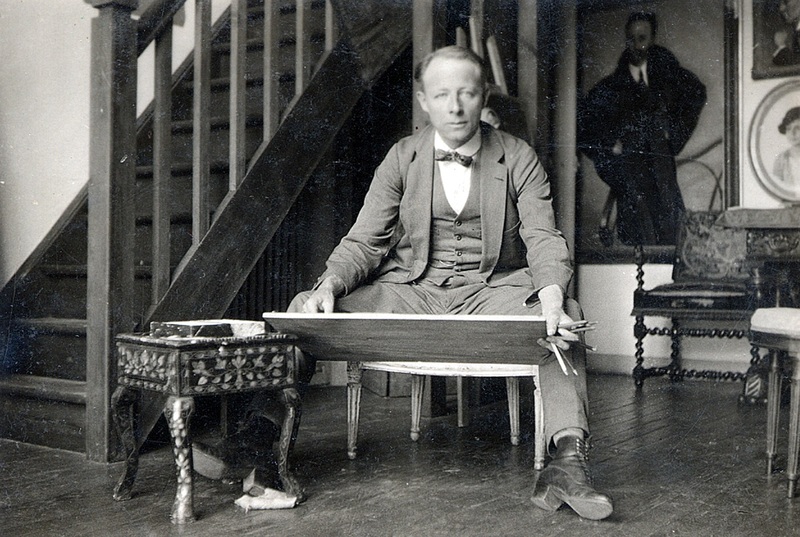 Joron, like the sculptor Letourneur or like Braque, was one of the artists who returned from the front line without turning nihilist or contemptuous of beauty… contrary to the Dadaist (who, in fact, had mostly stayed far from the front). In 1918, Joron marries. He will have three children, whom he will portray, including his daughter Marie-Louise, the donor of the museum, represented with her doll… 80 years earlier. Joron likes to paint his family – and will also practice self-portrait with a 3-sided mirror: his workshop is like a laboratory where he tracks the model’s mind. Commissions will establish his notoriety: politicians, high-society women, figures from theatre and literature (including Léon Daudet, whose portrait seems to have been lost) and their children, like those of Henri d’Astier de la Vigerie, a prominent résistant… His work depicts a (Balzac-like) human comedy of Parisian society at the beginning of the 20th century. His success comes from his skill for realistic depiction – and more, as this is a necessary but not a sufficient factor to make a good portraitist. Joron, moreover, pinpoints the personality beyond social appearance. This does not always exalt the model: the spoilt woman shows through a pout, the politician betrays himself with a touch of arrogance, ambition or smugness; but there is tenderness for people of modest means. Joron is not flattering, he is clear-sighted but not malicious. He sometimes regrets to have overdone it : “I should not have... but she is really like that!” Joron is the honest type who refuses to lie with his brush. There is a relationship between figuration, refusal to deform, and ethics. He is in search of truthfulness, but without stiffness. He left notes where he keeps analysing his production, in order to improve. These small texts certainly contributed to revalorize him : France is a literary country, where many viewers understand images only through words. Joron shows great respect for his female models in these texts, sensing that they do not like to look too sensual (what charms male eyes is felt as degrading by many women). With empathy, he looks at his models for themselves: “Women are not used to our disinterested attitude.” He is wary of the smile (photographers will always beg for a smile, even forced): “[smile] is a like a storefront, which hides real qualities.” A smile by Joron is subtly pervasive. His self-portrait with a brush is a good example. He seeks the movement of the heart rather than the physical movement, so much so that a lady thanked him for her portrait, explaining: "You help me to know myself better”. The refined Joron does not take part in the coteries and gossiping of mundane life. He, and his wife, prefer family life. “One should not work for posterity; one has to work for the present. One should not be afraid to depict everyone”. The portraitist thus works for the interest of the general public, not just for an elite. Joron sells well. He has exhibits in Nancy, Lille, London, Oran… His last notable commission was shipped to South Africa. His notes reveal that he is not worried about the competition with photography : “No mechanical apparatus will express the emotion that I feel”, he writes. The crisis of 1929 will wear down his confidence : a whole clientele is ruined. The winners of the crisis have another mind-set: admittedly photography is not as deep, but it is quickly produced, and is less expensive, so it suits them perfectly. What can be done? In 1930, to defend an artistic genre under threat, Joron creates the Society of Figure Painters, but that is not enough, and he must find other directions. In the period between 1925and 1930, he focuses on cardinals, producing caustic scenes with scarlet prelates in a Versailles-style settings. From 1930, he paints nudes then in fashion. The face this time has less importance than the body. But, faithful to his insistence on veracity, he works only from actual models, with draperies which emphasize the flesh; he collects fabrics for their sheen, to bring out matte skin. These highly refined nudes sumptuously echo the Venetian Renaissance… There is nothing pornographic in this, it is an ode to the human body, very far from the human meat painting in which a Lucien Freud is showcased today. Curious about techniques, Joron practices lithography and sculpture; he designed a stencil technique to produce door fabric, but did not manage to market it. “Such difficult work cannot be improved if there is a lack of concentration”. Elsewhere, always concerned with balance, he adds that it is necessary to know how to preserve some playfulness in painting, otherwise it will become laborious and will fail … He wants to capture life on canvas, strives to “be incisive”, stresses the importance of the first brush stroke, aiming at “execution as fast as the impression”, but also of the white areas in the outline. His reflections seem to converge with those of the Chinese monk called Bitter Pumpkin, meditating on the central role of the mythical single brush stroke or the importance of vacuum in painting. Joron probably has not read this ancient erudite, but there is a mysterious fraternity between painters. Joron, like Eastern artists, had his dream stones : “Look at it, he said to his daughter, just before his death, this stone is a wonder”, before raising his head and adding: “Up there, you see, it must be impressive – it is a world where there are only spirits…” Joron did not cover explicitly religious themes a lot, but his whole production is implicitly religious. Wonder at the works of the Creator does not has to be loudly emphasized – it is everywhere, like this special smile in the portraits by the Master of Bry. Joron did not think that an artist must be eccentric or a socialite but rather a wise man in search of excellence. He died at 54, leaving unfinished the painting of a bunch of gladioli, very touching to see in Bry on the mantelpiece in the reconstituted workshop.